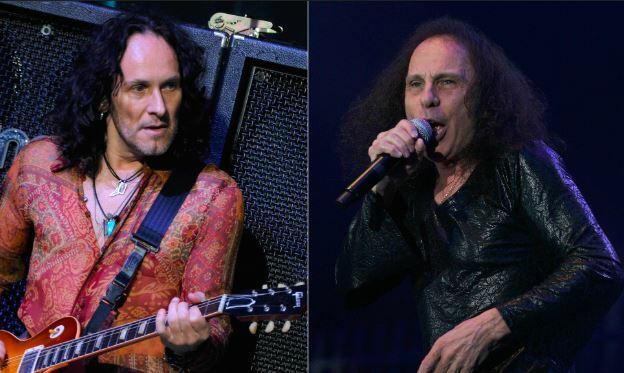 Jimmy Kay from Canada's The Metal Voice ( https://www.facebook.com/themetalvoice) spoke to Ex- Dio, Last in Line and Def Leppard guitarist Vivian Campbell. Campbell, spoke about his battle with cancer, Last in Line's new album and not getting paid in Dio which resulted in him getting fired. LAST IN LINE's sophomore album, "II", will be released February 22 via Frontiers Music Srl. "I'm tired today I got another infusion yesterday, I'm supposed to do them every three to four weeks but given the touring schedule particularly last year with Def Leppard I had to push it to six to seven weeks. I've been very fortunate that I found a treatment that works for me. I was part of a clinical trial for this new wonder drug almost four years ago and now it got FDA approved and it's working for me, so it's holding everything in place. Also it has minimal side effects, it's immunotherapy a general term given to a bunch of these new drugs that basically bolster the immune system and the body and so your body can fight cancer. My oncologist seems to be happy for now. I feel very fortunate as there's only about a third of the population who actually has been able to use this drug and get good results from it because it's based on your genetic makeup. You have to have a certain genetic marker in order to be given this drug, something called PDL, which I happen to have and about a third of the population has as well. This drug will be given to people regardless of what your what kind of cancer you have, as long as you have this PDL. So if you have lung cancer or in my case lymphoma it will yield good results." "Jeff has so much energy. Jeff is very upbeat, funny, it's always a better room when Jeff is in it. Jeff's musical talent is quite diverse too, he's a lot more than a bass player, he plays keyboards, guitar and sings. He is also a very experienced and talented songwriter, engineer and producer, just a really really well-rounded very talented artist. It's always a pleasure to work with Jeff, the hardest part about working with Jeff is just nailing him, he's so busy and that's true of all of us." "We have to work around everyone's we're evolving busy schedules and and we kind of do these records piecemeal, it's not like we go in and we've got three or four weeks to actually make a record I mean that would be luxurious. We'd write and record two three four songs at a time and then there would be months in between where we would reconvene and do another two three four songs." "There's the underlying element of the Dio vibe yes, that's because we have 50% of the original Dio members in this band now. When we started the project Jimmy Bain was still alive, so when Jimmy, Vinny Appice and I played it was like the Holy Diver album all over again.There's just a chemistry that the three had when we played together. Losing Jimmy Bain was a real kick in the nuts for us but we eventually we carried on and we were very fortunate to get Phil Soussan (Ex-Ozzy). Phil is very much cut from the same cloth as Jimmy and in terms of understanding the kind of dynamics or that kind of music but he's a different player than Jimmy. Jimmy was a very fundamental player, with a huge tone and just great timing. Phil is less of a fundamental player he's a little bit more adventurous and musical and he wants to find passages to play." "When the project started we had no ambition other than to play songs from the first three do albums and play some clubs around LA where we were living at the time. Had I known that we were going to record and release albums of original music I would have thought twice about naming the band Last in Line. It just seemed like a very appropriate title at the time. Ronnie had passed away about a year and a half prior to us starting this project and we just wanted to go ahead and play the early Dio songs and have fun. Nobody thought it was gonna grow and become a real serious band but here we are." " I would say, I have no idea to be honest I'm not familiar with them. I don't listen to a lot of music, I generally live under a rock and I just kind of do my own thing. But you know if our singer Andrew Freeman had walked into that rehearsal room back in late 2011 and if he had sounded anything like Ronnie I wouldn't have planned any shows. I just think that would be a bit cheesy,. Ronnie was the best of his genre and he was just like such a gifted singer had such a unique voice and tonality and style. I think it would have been really creepy to to go on stage with a Ronnie clone. I had a lot of people say to me why didn't you get this guy or that guy they sound like Ronnie but that's totally missing the point,. Andrew freeman is a really strong singer, he can sing anything and he can sing the Ronnie stuffy that's in his wheelhouse and but he does it in his own way. The tonality of his voice is totally different and makes it his own and that's what appealed to me in the first place and that's what made this in interest project for me." " I was in my early twenties and it wasn't about the money to me but it's about the principle, I'm very very big on principle. When somebody makes me a promise I expect them to keep it because I keep my word it's that's just the way I was brought up. When I tell somebody I'm going to do something I meet my commitments. Ronnie had made us a promise and payment and we worked for very little money, less than our road crew and the band was very successful. Back then people bought records and we were selling a lot of records and we were all very involved in the creative process, it was really a collaborative process. We were kind of squeezed. Wendy Dio who never really saw it as a band. She never really saw the value in the band and that's something that really really upset me. " "After I was fired I think Ronnie knew better he understood the real magic that the original band had and the chemistry we had and how we created together. I think Ronnie was really fearful of her and he never stood up. Like I said it was never about money I just wanted what Ronnie promised, it was a contract that was between the four of us and and he just wasn't man enough to follow through on it and and I called him on it and I got fired as a result. It was very painful for me for many years. We never got royalty checks that was the whole issue, we worked for for minimum wages even though we were writing the music we got no royalties, we got none of the merchandise or the t-shirts or those ticket sales for the venue's or anything. We got a flat salary that was less than the road crew. Ronnie had promised by the third album Sacred Heart there would be an equity situation so that was the the principal that got me fired. You know they offered us a few few hundred dollars more per week and then I got sent a contract by Wendy and it said failure to sign and return this contract by this date will constitute you're no longer being in the band. I tried to call Ronnie, I was in Ireland at the time, it was a break between legs of the Sacred Heart tour which finished North America. I'd gone back to visit my family my parents and I got this contract in a FedEx envelope and I was shocked I opened it and and I tried to call Ronnie and he wouldn't answer the phone. Next thing you know Craig Goldie is the guitarist. It was a seamless transition obviously it was well-executed and planned you know but that I wouldn't change any of that, I would change maybe how I reacted to it in later years. Ronnie and I both made the mistake of airing our grievances in public which is never a good idea but you know it is what it is and it was only after Ronnie passed away that I was really able to kind of look at the entire situation in a very different light. For years I didn't want anything to do with with the legacy of Dio. Later on I really wanted to reconnect with that fire. "I really don't know I mean you know Joe Elliot put it out there in an interview. I know that Pete's Willis was welcome to come join, I hope he does I really do. I only ever met Pete once many years ago very briefly and you know I don't know the guy at all but he was a very very important part of the legacy of the original Def Leppard. I think it'd be great if he shows up. " "I think if the gatekeepers would have let that happen Ronnie and I absolutely would have worked together again. There are always people who come between artists. People always ask me well what's Ronnie like. Ronnie had his good days and his bad days there were days when when Ronnie was really difficult to be around and there were days when he was a real pleasure to be around. I think Ronnie was very proud of me as a guitar player particularly in the early days he really liked taking me around L.A .saying this is my new guitar player, look what I discovered, like Ozzy had Randy Rhoads. I wanted to bring my best riffs and then play my best solos I wanted to be the best I could be for that band and then I gave my all because again we were working towards a common goal or so we thought. " LAST IN LINE - "The Making of: Starmaker"
Famed DIO, BLACK SABBATH and HEAVEN & HELL drummer, VINNY APPICE, joins Mitch in this special YouTube edition of One On One With Mitch Lafon. Vinny checks in for a quick update on his new band LAST IN LINE which includes the classic DIO - Holy Diver lineup featuring Def Leppard's Vivian Campbell and bassist Jimmy Bain. Singer Andrew Freeman (Lynch Mob, Hurricane) rounds out the band. Their new album Heavy Crown is released in February 2016. He also discusses his RESURRECTION KINGS side project featuring Chas West (LYNCH MOB), guitarist Craig Goldy (DIO, DIO DISCIPLES), and bassist Sean McNabb (DOKKEN, GREAT WHITE). Their debut album is slated for January 2016. Vinny also addresses the current drumming situation in BLACK SABBATH and whether or not he'd like to join them for their Farewell Tour. Reminisces about the Black Sabbath MOB RULES album and picks his favorite between the Holy Diver and Mob Rules albums. Vivian Campbell: "Viv is moving along with his health and he's doing really good now." LAST IN LINE (the band): "Out of all the bands I've played with - this is my favorite combination of 'band'. I look forward to going to rehearsals. I look forward to being with them. It's just fun." KILL DEVIL HILL: "There were a lot of things going on. It wasn't pleasant. It was a great band, but it wasn't pleasant." BLACK SABBATH: "When I first joined the band, I was a kid. I brought my drums down to audition with them in my '67 Mustang. It started out from there and it was always 'you're in the band until Bill Ward comes back'. They expected him to come back. This was his baby."